P1 drip tape utilizes innovative technology offering many benefits to the grower. A protected flow system devised by the Irritec research department allows the P1 to be buried in the soil without problems caused by encroachment of mud and debris and reduces the risk of root intrusion to a minimum. The system works through a special “flap” design on the outlet hole. During the irrigation cycle the flap opens, allowing an even flow of water; when the cycle ends the flap returns to its resting position, closing the hole and thus blocking any entry of mud and detritus. This drip tape is great for better coverage on longer runs. When you water slower and longer, you also water deeper. 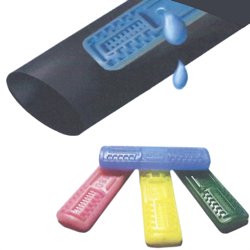 P1 Ultra Tape works with T-Tape, Aqua Traxx and Chapin Drip Tape Systems. If you are a first time user of drip tape, we recommend that you start with our 15 mil tape. Drip tape is not well-suited for curves or bends.